Eaves are the overhanging lower part of roofs. Eve is short for evening, and usually refers to the night before a holiday or event. Dad hung strings of lights from the eaves on Christmas Eve. Elicit is a verb meaning to draw out or evoke. Illicit is an adjective meaning illegal or morally prohibited. Using torture to elicit information is illicit behavior. I’d venture to guess that no English speaker has ever mistakenly written ewe when he meant the pronoun you, but I suppose someone might not realize that the word for female sheep was spelled ewe. 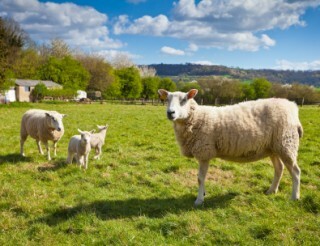 Did you see the ram and ewe with their lambs? I is the first-person pronoun, of course. Eye is the body part, and aye means yes or yea. There are just a few E homophones, but too many F’s for me to easily combine them! Looking for a great way to improve teen writing skills? Check out WriteAtHome.com. We’ve been helping middle and high school students develop their writing for more than a decade! We’re always taking enrollments for upcoming classes! Ran across this one today in a Bible study: “Understanding the love of God can be illusive.” — Oops! I sure hope they meant elusive. Ooh, that’s a good one. Sorry I missed it. How about “effect” and “affect”? They may not be official homophones, depending on the way they’re pronounced, but I often see them used incorrectly! AFFECT is used as a verb, and EFFECT is a noun. See what Grammar Girl says about it here: http://grammar.quickanddirtytips.com/affect-versus-effect.aspx.